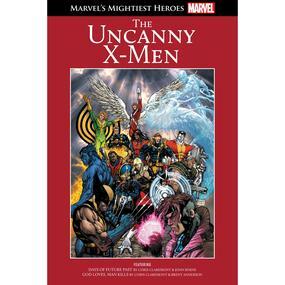 It was interesting to see another of Marvel’s teams of superheroes in this book. I was a little disappointed not to have the opportunity to see one of the first comics of the X-Men, but I felt that the storylines shown here did a good job of showcasing the team and their abilities. I felt it was good to have some background to the team in the first comic, even if it was kind of an exposition. I felt a lot of sympathy for Cyclops’ character in the first comic, though it was disappointing to see that he felt the need to leave the X-Men. Although I would have liked to see more of the other team members, it was interesting to see the ones I was able to. I liked the opportunity to see Kitty Pryde as both a child and as an adult. It was good to see her future self return to the past… particularly to see the contrast between her fear of Nightcrawler as a youngster and her happiness upon seeing him as an adult. I thought it was interesting to see the relationships that Kitty had with the other X-Men as an adult and, in particular, to see her relationship with Colossus. I thought it was good that they talked about losing their love if history did end up being changed. It was also good to see that Storm cared so much about Kitty and I would have liked to see more of that. Since I originally saw him in the cartoon of the X-Men, Nightcrawler has been among one of my favourites… and these comics cemented that for me. Despite his outward appearance, he came across as noble and kind and I would have liked to see more of his interactions with Mystique. As with most of the other comic books, I felt that the second comic was much darker and grittier than the first set. It was interesting to see the X-Men working with Magneto and it was incredibly sad to read the very first scene in the comic. I thought it was good to see more of Professor Xavier in the second comic, too. I was able to empathise with him and I felt he came across as stronger than he really appeared. In the future, I’d like to read more of the Uncanny X-Men… and have the opportunity to meet others who have been part of the team.